Hello and Welcome to the Akwati Style Blog! Thanks for stopping by! As I hope you know by now, my name is Angel, and this is my personal space within the Akwati Style brand. I hope to share with you pictures and information related to travel, cool textiles, global culture, and fashion! Yes, yes. I know. Slow down, Angel. I recognize that I can have 4 blogs about these four topics! Well, dear Akwati Angels, if I’m not going a million miles a minute, I may as well be at a standstill. I will post here periodically, and I hope that you come along with me for this ride. Today is going to be a short post, but I wanted to answer the following question. Where has Angel traveled to in 2016? I went to India! I had a fantastic time, and look forward to returning! Here are a few pictures for your viewing enjoyment. 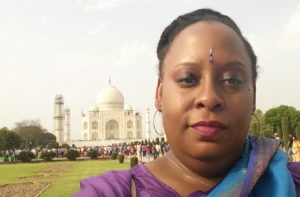 The Taj Mahal is a mausoleum of white marble, built in Agra, India between 1631 and 1648 by order of the Mughal emperor Shah Jahan in memory of his favorite wife. The Taj Mahal is one of the new wonders of the world, and is a UNESCO World Heritage Site. Sidenote: I love the purple and teal colors in my Sari! I could not leave India without learning more about how fabric is produced. Akwati Style loves textiles! 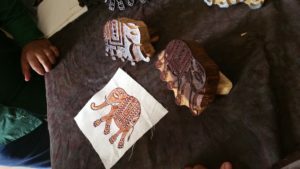 I visited a textile mill where local artisans hand-made batiks. Batik is a technique of wax-resist dyeing applied to whole cloth, or cloth made using this technique. Batik is made either by drawing dots, images, or lines with a spouted tool called a canting, or by printing with a copper stamp called a cap. Popular Indian Batiks are made with images of elephants or peacocks (which happens to be the official bird of India). I actually observed real elephants and peacocks walking through the streets of India. Elephants are such majestic magnificent creatures, and the beautiful brilliant blue plumage of a peacock rivals no other bird. Part of the reason why I traveled to India was because I wanted to experience Holi. Holi is a Hindu spring festival in India, also known as the festival of colors or the festival of sharing love. The festival signifies the victory of good over evil, the arrival of spring, end of winter, and for many a festive day to meet others, play and laugh, forget and forgive, and repair broken relationships, and is also celebrated as a thanksgiving for a good harvest. Holi celebrations start on the night before Holi with a bonfire where people gather, do religious rituals in front of the bonfire, and pray that their internal evil should be destroyed as the bonfire starts. 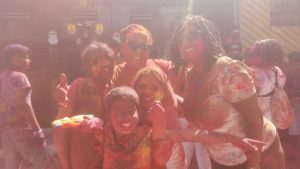 The next morning is celebrated as Rangwali Holi – a free-for-all carnival of where participants play, chase and colour each other with dry powder. The one word I can use to summarize Holi experience is: Happy. 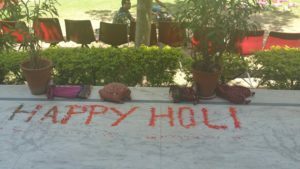 My group wasted no time enjoying the festivities with Indian locals, as you may be able to infer from the picture listed above. So beloved readers, one of my first trips in 2016 was to the country of India. I fell in love with India’s charm, and I will return soon! In closing, welcome again to my person Akwati Style Blog. Please leave comments or send me an email (angel@akwatistyle.com). I read every single one of them, and look forward to engaging with you soon!